Rochester is freaking out for photonics. But what is it? Here's what we know so far. Rochester is undeniably excited about photonics, even if much of the community doesn't know what it is. But there's good reason for the buzz, since Rochester will be the heart of a national initiative to build an integrated photonics industry from the ground up. The Department of Defense is keen on integrated photonics, which basically weds ultra-high-tech optical systems with high-tech electronics. It's putting approximately $115 million into the initiative, known as the American Institute for Manufacturing Photonics. The DOD solicited proposals from across the country, and a contingent led by SUNY Polytechnic Institute in Albany, University of Rochester, and Rochester Institute of Technology submitted the winning application. The pitch included an additional $250-million investment from New York State; a $250-million investment from the photonics industry, research universities, and other states; and a headquarters in Rochester — a region with a long, pioneering history in photonics' twin field of optics. Officials now know where the headquarters will be located, despite an early, embarrassing quarrel between some Rochester leaders and SUNY Polytechnic officials. Legacy Tower, the former home of Bausch + Lomb's headquarters, will house the institute's business offices, and the Sibley Building will house companies, incubator space, and a workforce development center. "This has been decided, now we can really move ahead," Assembly Majority Leader Joe Morelle said the day the locations were announced. The institute's lead partners have also decided that 30,000 to 50,000 square feet of unused space in a building at Eastman Business Park will house the primary manufacturing and prototyping facility. That's a crucial decision, not only because viable photonics manufacturing is the end game, but because government, academic, and business leaders are fired up over the prospect of new jobs in a cutting-edge industry. Photonics is exciting and inspiring, but it's also incredibly technical. Specialized scientific and engineering expertise will be needed to get the technology into production; Rochester has both. But AIM Photonics is still a massive, complicated, nationwide undertaking. While it's generated a tremendous amount of interest and enthusiasm across the region, it's also generated a lot of questions, even among the people tasked with running the institute. 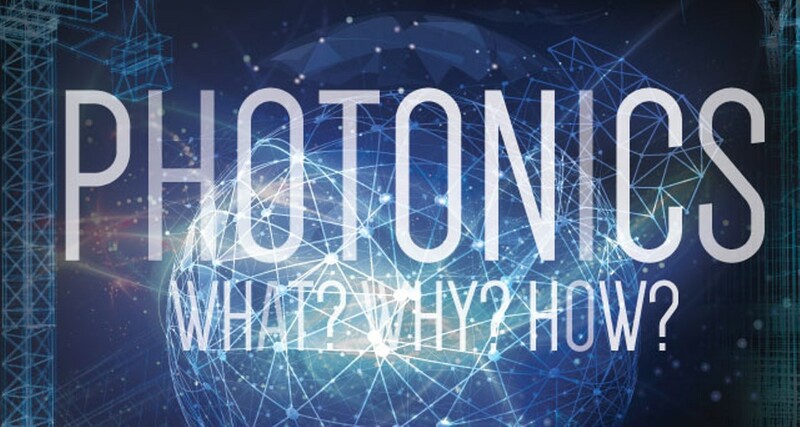 The following is a sort of FAQ on the photonics center, with much of the information culled from conversations with two governing board members: Rob Clark, University of Rochester's senior vice president for research; Michael Liehr, SUNY Polytechnic Institute's vice president of research; as well as Alan Willner, chair of the National Photonics Initiative industry consortium. Rob Clark, University of Rochester's senior vice president for research. Photonics means slightly different things to different people, so it's best to start in the broadest terms. Generally speaking, photonics refers to the development of technologies based around the application, manipulation, and use of light. It's basically the same thing as optics, which focuses on the transmission of visible light, such as lasers, and invisible ultraviolet and infrared light. Some scientists and researchers differentiate between the two, often viewing photonics as more of an application-oriented field. "Frankly, there's almost no system that you can think of today that doesn't use optics and photonics in some way," Willner says. "You may not realize it from the outside. It's transformed the military systems right and left, it's transformed communications, it's transformed social networking of course, biomedicine... sensors." Fiber optic networks are a common example of photonics at work: powerful lights and extremely thin glass cables are used to transmit massive amounts data at very high speeds, often over long distances. A lot of very smart people have been developing ways to miniaturize optical systems and to integrate optical components into small chips. Clark draws a parallel between the work happening in photonics and the advancements in electronics and semiconductors. Electronic components used to be big and bulky, but now people are able to carry powerful computers — smartphones — in their pockets. "Integrated circuits and the semiconductor industry — you know, computer chips — were a huge leap in electronics and technology," Clark says. 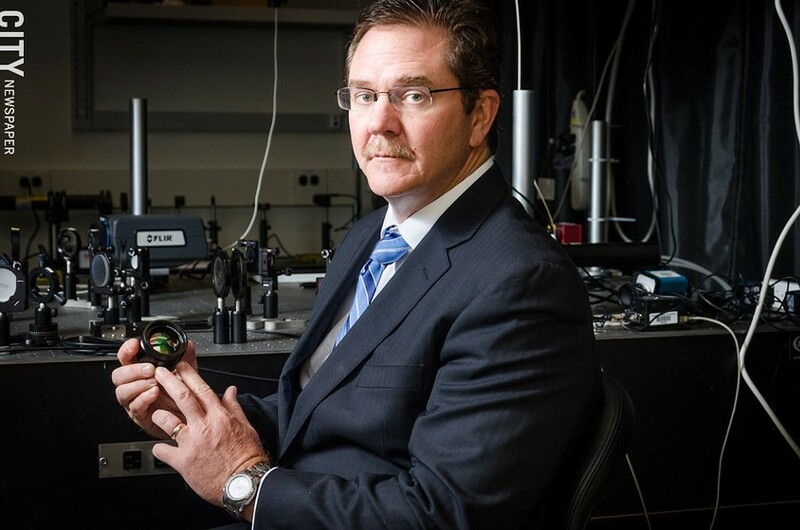 "And I would say that integrated photonics is another huge leap in technology that will connect to electronics, but also can replace some of the things that we actually do with electronics now." Ultimately, photonics technology could lead to faster and more efficient computer data centers, improve medical imaging devices, provide for more robust communications systems, and even lead to new displays. Photonics has potential for industrial processes, too. University of Rochester professor and optical physicist Chunlei Guo has found a way to use lasers to make metals and other materials highly water-repellent or water-absorbent — he's researching the technology at the school's laser lab. The US Army is interested in the technology for defense purposes and the New York State Energy Research and Development Authority sees potential for it to improve the efficiency of air conditioners. What is the purpose of AIM Photonics? First and foremost, AIM Photonics is a Department of Defense program. The DOD sees promise in the technologies, especially for use in infrared imaging, radar, sensors, and something officials refer to as "electronic warfare," which means radar jamming and similar technologies. Many of the institute's innovations will end up in battle gear, including drones. Integrated photonics technologies are in the works, Clark says, but the capacity to build the systems doesn't exist in the United States. The technology can be produced offshore to some degree, but that's a problem for the DOD. "The Department of Defense certainly isn't going to rely on a nation outside of the US as a supplier for a critical component like this," Clark says. "It's a core capability we need to have." So in a nutshell, AIM Photonics is tasked with building a domestic integrated photonics manufacturing industry from scratch. It needs to develop industry standards and procedures, as well as equipment to manufacture emerging technologies on a commercial scale. The technologies will ultimately have an impact beyond the military, since defense innovations often trickle down to the consumer market. Much of what's inside a smartphone, a personal computer, or even a simple radio started as military tech. And the DOD wants to see improvements in the technologies' performance, size, and cost, which is what will make the systems appealing for consumer products. Liehr and Clark point to driverless vehicles as one potential area for defense-consumer crossover. Autonomous vehicles use optical systems to keep from crashing into things, and advances in photonics technologies could make the systems smaller, more powerful, and more efficient. Those improved systems could be equally useful for crash-avoidance systems on consumer and military vehicles, as well as for imaging systems on military vehicles. The same technologies could even power video game gesture-recognition systems, Liehr says. Why is Rochester a good fit for this institute and industry? We've all heard this story before. Rochester is the birthplace of three major optics pioneers: Kodak, Xerox, and Bausch + Lomb, and as a result, the region has trained generations of scientists, engineers, and manufacturing workers. The workers from the Big Three, who were once the region's top employers, know how to develop optics-related technologies, how to prototype them, and how to ultimately manufacture them. "Rochester's DNA is optics," Willner says. But when the companies started shrinking, many of their employees struck out on their own. Rochester has approximately 80 small- to medium-sized companies that work in optics, whether in design and mechanical work or building lenses and displays, Clark says. They're used to collaborating to advance their industries and technologies. And most of the top companies that need optics components or design work come here for it, he says, including Apple and Google. The region has an equally long history of teaching and training people to work in the industry: University of Rochester and Rochester Institute of Technology, for example, each have longstanding optics programs. And Monroe Community College is continuing efforts to ramp up its advanced manufacturing training programs. But Rochester's history isn't the only factor. The DOD was impressed by the national consortium that got behind and is woven into the New York application. The consortium included 55 companies, 20 big-name universities and research labs, 16 nonprofit industry and science groups, and 20 states. What will be the economic and job benefits of AIM Photonics? The photonics institute is backed by more than $600 million in federal, state, and private sector funding, but not all of that money will come to Rochester and New York. The Rochester region should expect to see investments between $120 million and "a couple of hundred million" from that pot, some of which will come from the state's $250 million commitment, Clark says. The funding will be used to set up and run the Rochester operations. Additional private investment is likely, however, since many of the companies that'll be involved with the effort will want to be near the Rochester hub. If they aren't here already, Clark says, they may relocate or at least open a Rochester office. When the institute was announced, some elected leaders said that it'd bring thousands of jobs to the Rochester area. But the truth is nobody really knows how many jobs the institute will create. The region could potentially see between 5,000 and 10,000 jobs over the next five to seven years, Liehr says. The positions will include clean room workers, workstation operators, information technology staff, security officers, and safety personnel, he says. And approximately 60 percent of the jobs will require only a two-year degree. "I think it'll be a range of jobs as this evolves," Clark says. "I can't predict them. Ultimately, it'll depend on what parts of the manufacturing chain and industry decides (sic) to locate here in Rochester." What will be expected of Rochester, and how soon will the community have to deliver? The Department of Defense will fund the institute for five years, and then it expects the initiative to be self-sustaining. The government is investing in the effort because it believes "that between the universities, the corporate partners, and the commitments of the states that are engaged, that when the government investment goes away, that this will continue to survive as a vibrant manufacturing institute that enables this technology for DOD as well as other industry," Clark says. That's about as specific as the answer gets, with one interesting exception. The Rochester region and the state are also expected to put considerable resources into ensuring a capable, well-trained workforce for the integrated photonics industry. Assembly Majority Leader Morelle says that somehow, the region's schools are going to have to work photonics into their teaching. Liehr says that the public-private partnership around the institute will have to invest in education and workforce development. "Rochester will be called upon to maintain its highly skilled workforce, as well as the pipeline of k-12 and college students interested in integrated photonics," Liehr says in an e-mail. What facilities need to be built in the region? And what already exists? This is another "it depends" answer. To some degree, the facilities, just like the jobs, will be determined by the companies that decide to do work in Rochester. "In terms of what form and what kinds of facilities will have to be located where and what industries will stand up in different places, or what will be needed, I think it's a fairly fluid thing right now," Willner says. But the central piece of the institute will be the prototyping and manufacturing space at Eastman Business Park, which will open to researchers regardless of company or research institution affiliation. Researchers say that the lack of such open-access facilities in the US has hindered the development of integrated photonics technologies. Designs could be sent offshore for fabrication, but there's a risk that other countries will build on American innovations. Some new equipment will have to be installed in the Eastman Business Park space. But the building already has fully-equipped clean rooms, which are critical for assembling photonics technologies. "You're building an infrastructure that no one company would make a single investment in building, but many companies can use to leverage for the future of integrated photonics," Clark said during a press conference after the Eastman Business Park site was announced. The institute's Legacy Tower business office and technology accelerator will be set up first, and it should open within a few months. The Sibley Building will house a photonics-specific workforce development center and will also be used for incubator space and offices for companies. The choice of the Sibley Building for incubator and office space makes a great deal of sense. High Tech Rochester, a not-for-profit affiliated with UR that assists start-ups, is opening a business accelerator there. And the state has already designated space in the building for its START-UP NY incentive program. Under START-UP NY, eligible companies and their employees don't have to pay state taxes for 10 years. "We're not going to tell people they must perform manufacturing here," says University of Rochester President Joel Seligman. "We're going to make it irresistible for those interested in pursuing manufacturing not to be here."